I like where this is headed. The sub-skill feature that allows them to be added for checks is nice, and I like that you've put bonuses in both combat and non-combat areas. Lvl 1: If you (char with explosives) have a grenade in your inventory, you can choose to hit a random enemy position before combat begins. Lvl 2: If you have a grenade in your inventory, you can target a specific enemy before combat begins. Lvl 3: If any party member has a grenade in their inventory, you can target a specific enemy before combat begins. Lvl 5: Using a grenade in this fashion does not consume the grenade. Lvl 10: You can use this ability without a grenade in your inventory. Lvl 100: You have infinity grenades. Well as said, the skills in this game won't be in 1-200 range, more like 1-10 or perhaps even 1-5 (need still to think). Culture would provide new info on each level as you said. Explosives could simply be a multiplier of the damage (your suggestion is even too much detailed lol). Anyway the next step to have a playable prototype is to make the combat skills, then I'll have a better idea of what those non-combat ones could boost. I am thinking to have 4 class based and 4 unique skills each character though if I have 5 levels of each might be a bit too much We'll see! Those skills can be learned by any character, they just have some starting point already at the beginning, but that's it So that won't be a problem. Okay, that makes me feel a lot better. 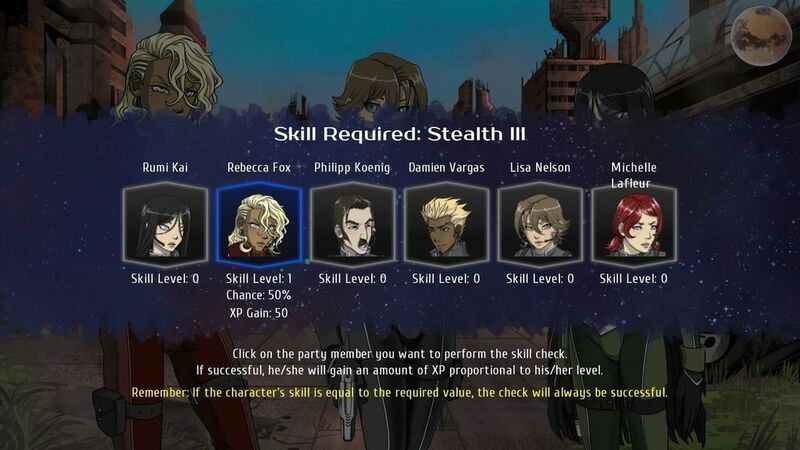 I thought each character could put points into either sub-trait but there were character-specific combat/non-combat bonuses based on the way the character names were placed in the table. Thinking about it better, I might have custom skill caps depending on classes. For example Psionics could have of course the max skill cap for Psionics while Soldier wouldn't be able to use that at all (since they can't also use Psionics skills in battle it would be weird) but would be specific class restrictions. so today I've implemented a small but significative change to the skill checks. Before I was using same system of Cursed Lands, however I noticed that wasn't working well (mainly because in CL only main character had skills, here the whole party). I decided to go back to percentage based success, of course if the skill level is the same the success is always guaranteed (100%). Otherwise is random, but I've coded random in a way that always returns the same values so you can reload 1000 times, and that skill check will always return that value. This should definitely prevent save-scumming!